Archaeologists uncovered versatile knapped stone tools dating back to 80,000 years — a technique which was thought to have evolved much later in Asia. These artifacts found in China are among the nearly four dozen that reflect the Levallois technique of toolmaking. Image credits: Marwick et al / Nature. The team reports finding “Levallois stones”, which are a distinctive type of stone knapping developed by the ancestors of modern humans. This type of technology first appeared in Europe and Africa some 300,000 years ago and is remarkable because it represents “multi-tool” of the prehistoric world — a sort of Swiss army knife of these ancient times. 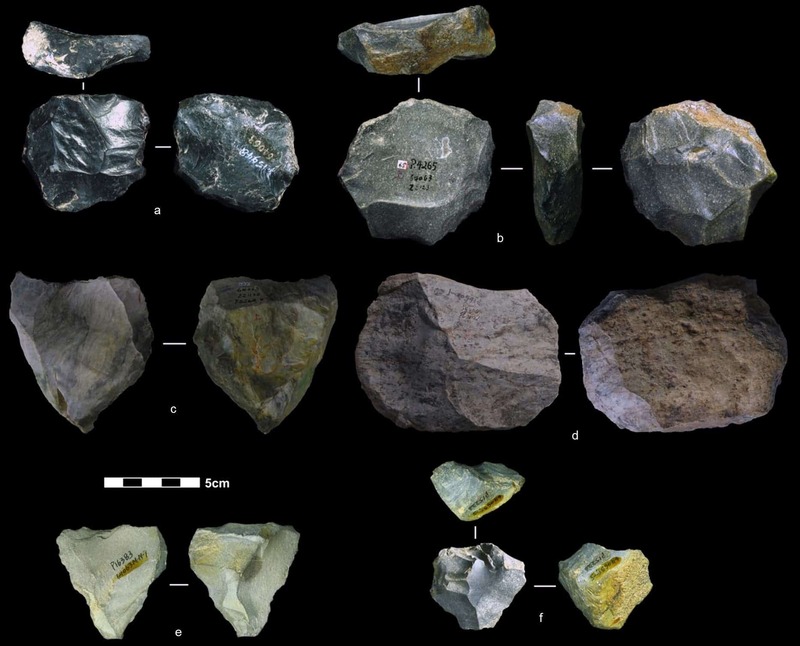 However, this type of stone tool was thought to only appear in Asia around 40,000 years ago, so the new finding pushes that date back by quite a bit. Since researchers were unable to link the discovery to any fossils or migratory population, they believe the technology was developed independently in Asia. The technique involves the striking of lithic flakes from a prepared lithic core. The core’s edges are trimmed by flaking off pieces around the outline of the intended lithic flake, creating a domed shape on the side of the core. Then, when the striking platform is finally hit, a lithic flake separates from the lithic core with a distinctive profile. This method provides a great deal of control regarding the size and shape of the final tool, which would have been used as a knife or a scraper. Projectiles could also be derived using a similar technique. This type of tool is considered definitory for the sophistication level of the culture that built it. They were named after the Levallois-Perret suburb of Paris, where the first such stone flakes were found in the 1800s. The artifacts are not new — they were made in the Guanyindong Cave in Guizhou Province in the 1960s and 1970s. Marwick and colleagues now dated them using optically stimulated luminescence (OSL), which can determine age by assessing when a sediment sample, down to a grain of sand, was last exposed to sunlight — thus indicating for how long it was buried in sediment. This is a relatively unusual but precise dating technique. The map shows where Levallois artifacts have been found. 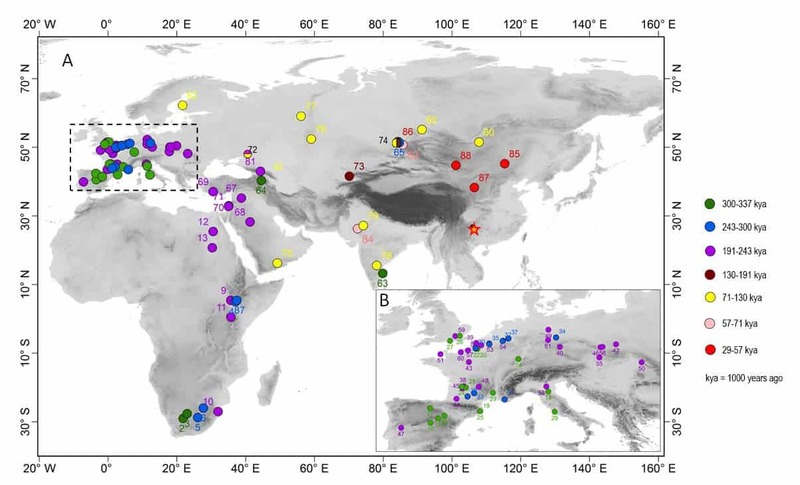 The oldest, dating to 337,000 years ago, have been found in Europe and Africa. The star on the map marks the site of Guanyindong Cave, where new research published in the journal Nature shows that this technology was used 80,000 to 170,000 years ago in Asia, much earlier than previously thought. Image credits: Warwick et al / Nature. It’s unclear who exactly developed the tools, though it was presumably one of the precursors of modern humans. After the Levallois stones, the next technological step was developing more-refined cutting tools made of rocks and minerals that were more resistant to flaking. This was followed by compound tools, such as spear tips. The main takeaway is that this type of stone tool innovation evolved independently in several parts of the world, which is not that unusual. Boatbuilding was developed independently in several parts of the world, as was handwriting, for instance.